Mon., Dec. 3, 2018, 9:55 a.m.
At times during his trips to the Gem State, President George H. W. Bush blended right in with Idahoans – jogging the Greenbelt and fishing the Middle Fork of the Salmon River. Of course, few of us have ever shut down the popular path with a private security detail. February of 1986 saw the then-vice president, who died Friday at 94, take an early-morning jog from the Main Street bridge toward Veterans Memorial Park, shutting down commuter traffic and sparking one of two gun-related panics during his time in Boise. From the late 1970s into the early ’90s, Statesman archives document Bush visiting Idaho nine times. It was a different era: In the reliably Republican Idaho of today, visits from sitting presidents, vice presidents and presidential hopefuls are relatively few and far between. 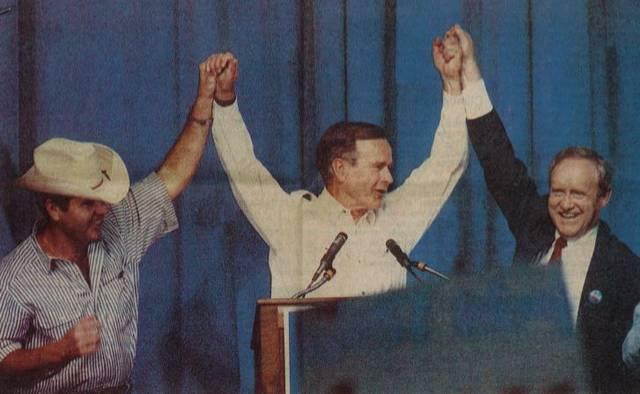 The Greenbelt run came during Bush’s fourth political visit to Idaho, split up between a tour at Hewlett-Packard where Bush talked trade and a speech at a Republican banquet, where he promoted gubernatorial hopeful Dave Leroy and then-Rep. Larry Craig. The other gun scare happened four years prior. The vice president was dining at Chart House, a riverside steakhouse where Joe’s Crab Shack is now located, when a man carrying a shotgun walked past. Bush was whisked beneath the table for several minutes and two Idahoans were arrested. The incident turned out to be nothing — two friends walking home to Garden City to return the unloaded firearm – but Statesman articles would refer back to the scare for years to come. “Bush ducked under table on ‘82 visit,” declared one headline alongside a story about Bush’s one and only visit as sitting president in 1990. “A waiter joked to the squatting vice president that he could bring him a booster seat so he could eat his steak,” a 2015 article recalled. Even Bush’s mundane movements were fodder for the press. In 1982, the Statesman chronicled the vice president’s trip to a hotel gift shop. “VIP shopper leaves store clerk flustered: Bush jogs, buys book, flies to California,” the headline read. The 20-year-old Kuna woman who helped Bush recalled his purchases: an Elizabeth Taylor memoir and Gillette razors, for which Bush used a 25-cents-off coupon that the nervous cashier promptly forgot to ring up. “I felt kind of dumb,” she said. Bush apparently didn’t notice. Bush was often accompanied by Sen. Jim McClure while in Idaho. The pair served in Congress together, and McClure in 1984 organized a fishing and float trip on the Middle Fork of the Salmon River for Bush and dozens of guests, Forest Service employees and Secret Service agents. That same year, Boise Mayor Dirk Kempthorne presented Bush with a key to the city and a brick engraved with his name that was later installed at the Grove Plaza. Bush returned in 1988 to promote his own presidential campaign, touting “pro-Western” policies and praising multi-use public lands. Six months later, he was elected president. While in office, he visited Idaho only once — but amid a whirlwind three-hour visit, Bush managed to again find common ground with Idahoans, cracking a joke over his notorious distaste for broccoli. Published: Dec. 3, 2018, 9:55 a.m.